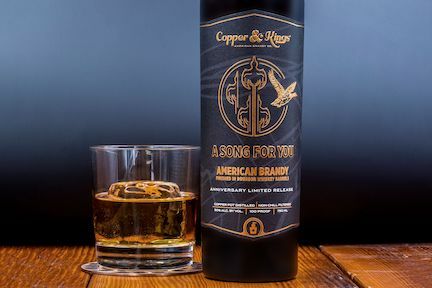 LOUISVILLE, Ky.— Louisville-based Copper & Kings American Brandy Co. is celebrating its fifth anniversary with A Song For You, a limited release American brandy matured in Kentucky bourbon whiskey barrels for five years. The American Brandy Limited Release is the original sourced “DNA1” blend of pure copper pot-distilled brandy that helped launch Copper & Kings in 2014. Bottled at 50 percent alcohol by volume, the youngest eau de vie in the blend is now, after five years, 8-years-old, and the oldest is 18, with most being 12 and 13-years-old. The varietal blend is predominantly Muscat de Alexandrie, Chenin Blanc and French Colombard, with additional layering of Thompson and other varietals. At the time, the brandies were sourced from seven states across the USA. Available across Copper & Kings at the distillery and at select fine retailers in the USA. Copper & Kings American Brandy Co. distribution footprint includes the following markets: Alaska, Arkansas, Arizona, California, Colorado, Delaware, Florida, Georgia, Illinois, Indiana, Kansas, Kentucky, Louisiana, Maryland, Massachusetts, Michigan, Minnesota, Mississippi, Missouri, Nevada, New Jersey, New Mexico, New York, North Carolina, Ohio, Oklahoma, Oregon, Pennsylvania, Rhode Island, South Carolina, Tennessee, Texas, Virginia, Washington, Wisconsin and Washington D.C.
About Copper & Kings American Brandy Co.
Copper & Kings uses small batch copper pot-distillation to forge untraditional, non-derivative, pure pot-distilled American apple and grape brandies, absinthe, gin and Destillaré liqueurs that are non-chill filtered with no added sugar, colors, artificial flavors, or synthetic chemicals. The state-of-the-art distillery exclusively focuses on the distillation of brandy-based spirits. Copper & Kings, located at 1121 E. Washington St. in Butchertown, is owned by beverage entrepreneurs Joe and Lesley Heron. For more information, visit copperandkings.com or follow @CopperAndKings on Facebook and Twitter.